Learn at your own pace with our SURFCAM Training Guides. These printed training manuals are a perfect way to learn our software at your own pace in the convenience of your own home or office. 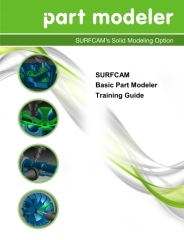 SURFCAM Basic Part Modeler Training Guide. SURFCAM Part Modeler is a cost effective, 3D modeling tool specifically designed for quick and simple construction and/ or modification of solid models and seamless import into SURFCAM. The SURFCAM Basic Part Modeler Training Guide provides step-by-step instruction allowing the reader to quickly understand the concepts and functions of Part Modeler. Click here to access the accompanying part files used in the training guide.